Sounds of emptiness fill the spaces between shelves stocked with jars of jams and jellies and refrigerators chilling meats, cheeses and produce. Mechanical hums from around the room harmonized with faint background music. On one end a girl in her early twenties squats, loading gallons of cider into a glass-front cooler. She hears the door close, offers a pleasant smile and goes back to bumping the sliding glass door open with her elbow as she slides and arranges the jugs. Just a few weeks ago, Fishkill Farms’ entire 150 acres were crammed with visitors vying for their share of a peaceful afternoon on the farm. Cars packed with families prowled rows of lawns-turned-parking lots, kids in orange vests waving them in. Apple cider - hot and cold - was dispensed gallons at a time; apple cider donuts by the thousands. Apple pies, apple sauce, apple butter. Apples in every possible configuration. Bands played and a haze of apple wood smoke hung in the air, anointing the masses lined up for burgers and chicken. In between, locals weaved through the crowd to pick up their share of the farm’s crops from the summer Community Supported Agriculture - or “CSA” program. CSA is a means by which customers can pre-pay for a share of what local farms grow each year, ensuring the farmers, in turn, have found a guaranteed home for at least a portion of their produce. I stopped in around mid-October to catch the preparations for the winter CSA in action. Beyond the bustle around the farm, even more was going on behind the scenes. An entirely different cast of fruits and vegetables were being planted, harvested and stored in preparation for the farm’s winter CSA program. While families picked apples and pumpkins, a small army of farm workers rolled bins of apples, squashes, potatoes and other root vegetables around into storage. For Fishkill Farms’ Business Manager, Mark Doyle, the weeks spanning October and November are a busy time when the summer wind-down and winter preparations converge during the peak fall season. As he makes his way across the farm, employees stop Mark to ask questions or update him on some ongoing progress. The Winter CSA, like its summer cousin, is a lesson in seasonal agriculture, albeit from an entirely different approach. Weekly summer shares rotate through an evolving sequence of fruits and vegetables cycling to ripeness weekly. The winter rendition depends on produce that’s coming in late through the season, some that’s been stored in late summer and early fall and still more that was frozen back in earlier months. Whereas the summer program puts a farm at your disposal, a winter CSA is like having your very own root cellar, larder, cold storage, deep freeze and cider press. Mark took me around the farm to show me various spots where some of the winter produce was coming from and where it was headed. As we talked, our stroll became a walking tour of each. Behind the barn and down a hill, now shielded from the din he paused before a pair of long metal frames sheathed in plastic sheeting. Inside, raised beds sprouted a palette of greenery as if within those walls, the clock was reset to early June. “Inside these greenhouses we can simulate spring all winter,“ Mark explained. We moved down the hill to several exposed rows of ruffled foliage. “Down here we have kale, brussels sprouts and some other winter-hearty greens. These will do well right down to twenty five degrees. In fact, as it gets cold, they become nice and sweet. Then farther down, some root vegetables. A lot of those get better after the first frost as well. Carrots for instance, take on a wonderful complexity after they get a frost. It’s a completely different flavor. On the ground a few turnips lay scattered down the row. Mark explained that sometimes some of the vegetables aren’t fit for retail for one reason or another - be they split open or damaged by insects. Those are left to be tilled right back into the ground to return their nutrients to the soil for next year. Mark pulled a few remaining turnips from the ground and examined them in the relative silence of the back fields, reflecting on the significance of keeping the CSA members coming in year round. While summer CSA programs have popped up across agriculturally-rich Dutchess County, winter versions aren’t nearly as common. That surprised Mark as he construed that not only was the demand there from the participants, but that it seemed both a natural extension of the summer and a way to keep the doors open through the winter. We made our way back up the hill, past a refrigerated shipping container packed with a variety of potatoes and then to one of the farm’s huge commercial buildings. Inside, workers moved purposefully between stacks of crates labeled “butternut,” “acorn,” and “kabocha” tucked away until they’re called out of hibernation in weeks to come. Then, of course, there were the apples. One of the great mysteries of the Winter CSA is the farm’s ability to dole out fresh apples - well over a dozen varieties at any given time - for months after they’re picked. While we stood in a cold, gym-sized room, the secret was revealed as two huge bins on wheels busted through the doors, drawn by a pair of the Farm’s seasonal help. Inside, crates are piled to the ceiling and held at 31 degrees. And that’s only a portion of the apples that will be brought out over the coming months. 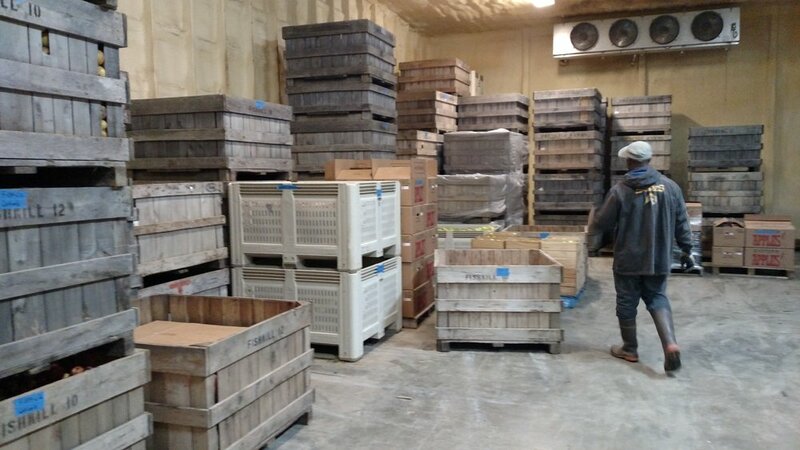 Fishkill Farms keeps even more offsite in what’s known as “Controlled Atmosphere” where the temperature, humidity - even the oxygen levels - are closely maintained in vault-like storage. “We’re always so happy to see our CSA members over weekends in the dead of winter, when there are only a few hardy souls venturing through the front gate.” Mark said with a smile. Back in the store, deep in winter, the crowds are gone. Only a smattering of locals stop by to pick up holiday turkeys, pick out Christmas wreaths and gather their winter CSA in relative tranquility. On this particular weekend the haul includes two kinds of squash - the popular butternut and a less familiar kombucha - red potatoes, rutabaga, and beets. Additionally, pears, quince, a bag of pitted and halved peaches that were picked and frozen back in warmer days and, naturally, apples - half a peck of mixed and a gallon of cider. My bags heavy, I pause for just a moment more to enjoy the silence. I anticipate the longer days and warmer weather, but for the moment I have “my” farm all to myself again.